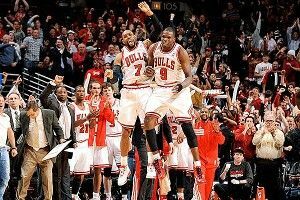 Against the Miami Heat, the Chicago Bulls found themselves up by two points with about three minutes left in the game. Looking to stretch their lead out, the Bulls went to a set that looked to take advantage of the Heat’s weakness of showing hard off screens and getting stretched out, something that we took a look at Thursday before the game was played. The play starts with Derrick Rose bringing the basketball down the court along the wing and Boozer meeting his man, LeBron James, with a screen. 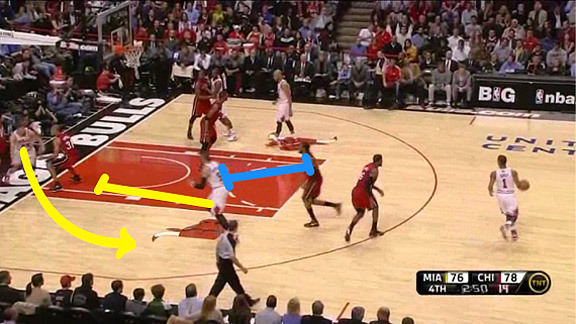 Rose uses the screen and attempts to take the basketball back to the middle of the court. On the defensive side of things, James is working around the screen, in an attempt to stay in front of Rose, as Ronny Turiaf, Boozer’s defender, starts to show hard. Because Rose isn’t really looking to attack as he comes off the screen, Turiaf abandons the hard trap and starts to return to his man, who seems to be popping out to the short corner, as James gets in front of Rose. However, Boozer isn’t popping out to the short corner, instead he’s head hunting Korver’s man, setting a pin-down screen for him — a pin-down screen that Korver is looking to curl off of. 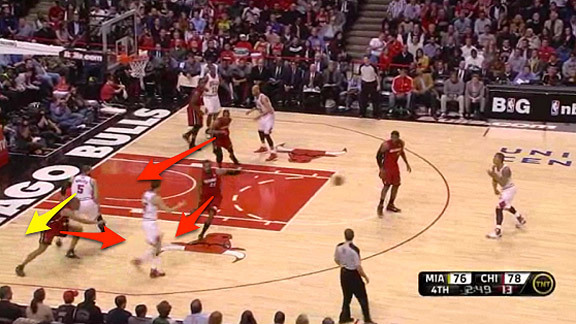 If Boozer was just going to set a pin-down screen, why did he start the set with a ball screen? 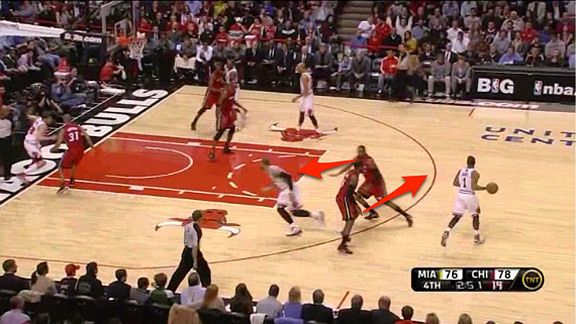 It’s because the Bulls wanted to get Turiaf showing on Rose, and even his quick show was enough to create space. 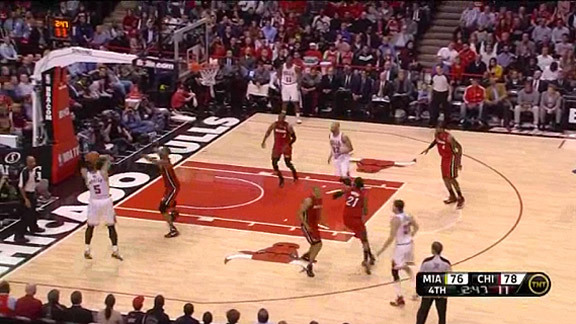 Turiaf now has a lot of space to try and make up as Boozer sets his pin-down screen. The result is Turiaf never making that space up. So as Korver curls around that Boozer pin-down screen, Turiaf is out of position. As a big trying to defend a pin-down screen and a curl like this, you want to be attached to the screener, extending yourself as need be. You want to be attached to prevent the screener from popping out and getting an open look as the shooter curls. Here, Turiaf is so out of position that he is forced to stay out and trap Korver (who knows if this was Miami’s defensive strategy for pin-downs) because it is the only play he can make. Chris Bosh does a good job of reading the situation taking place in front of him and he starts to range over, making the correct rotation based on the situation. However, Boozer knows that the rotation will be coming, so he makes the crafty move of take a few steps backward once Korver curls off him. 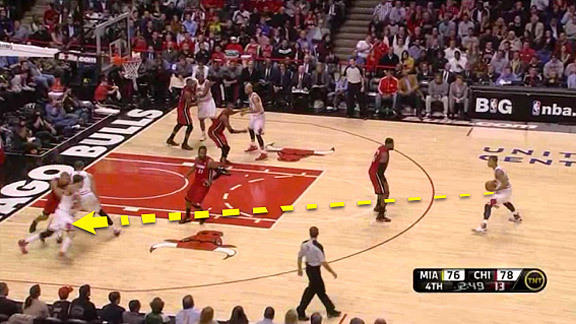 This stretches out Miami even more, forcing Bosh to make an even longer rotation. That one step back is incredibly important because as Korver makes the catch on the curl and gets trapped, he quickly gets the ball into Boozer’s hands (Korver might be the second-best passer off curls, behind Ray Allen). Before Bosh can get all the way over and contest the shot, Boozer rises and fires an open shot (by NBA standards) and knocks it down, giving the Bulls a four-point lead. The Heat eventually close the gap, but the Bulls were able to eventually get the win in overtime. This is a pretty fantastic set from the Bulls here. To start the set, they show a ball screen, and whether or not Rose is 100 percent, if he is involved in a ball screen, the defense has to respect it. Miami shows quickly, and that show puts Turiaf out of position to defend the true action of this set, the pin-down screen with Korver curling off it. 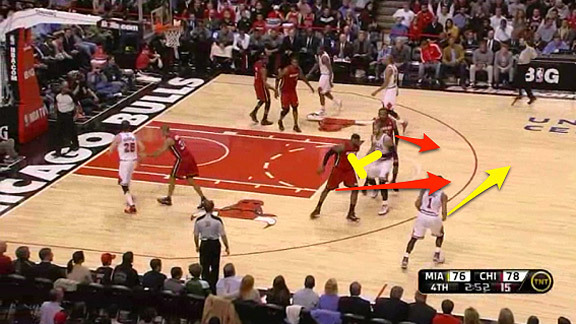 Once again, the Heat’s rotations leave them stretched out, and even though Bosh makes the right play, reading the situation and getting over, he’s not able to get there in time to stop the shot.